The VRC Sires’ Produce Stakes, formerly the Henry Bucks Sires’ Produce Stakes, is a Group 2 support act on ‘Super Saturday’ at Flemington Racecourse during the Melbourne Autumn Racing Carnival. Open only to two-year-olds and run over 1400m at set weights, the VRC Sires’ Produce Stakes runs on a Saturday in early to mid March and takes place at the same meeting as the Group 1 Newmarket Handicap (1200m) and Group 1 Australian Cup (2000m). 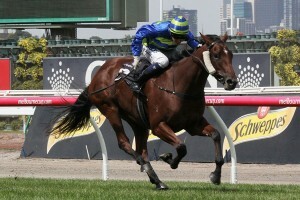 The race offers a total of $200,000 in prize money including $120,000 to the VRC Sires’ Produce Stakes winner. It was demoted from a Group 1 race to a Group 2 event in 2005 and remains the first two-year-old Group-status race over further than 1200m during the autumn carnival season. The latest edition of the VRC Sires’ Produce Stakes takes place on Saturday March 9, 2019. The full 2019 VRC Sires’ Produce Stakes Results & Finishing Order will be available below once the race is run and won on 2019. VRC Sires’ Produce Stakes betting markets are released after the final field is taken on the Wednesday before the race on ‘Super Saturday’. Two-year-olds with previous winning form often sit high up the VRC Sires’ Produce Stakes odds, especially those with form in the Talindert Stakes. In 2014 Marcado won the Talindert Stakes before his third in the Group 2 back at the track, and the following year Jameka (2015) improved off her Talindert Stakes fourth to win the Sires’ Produce. The Talindert Stakes – VRC Sires’ Produce double was last achieved by All Too Hard (2012) who went on to win the Group 2 Pago Pago Stakes (1200m) in Sydney and run second in the Group 1 Inglis Sires’ Produce Stakes (1400m) to Pierro at Randwick that campaign. The VRC Sires’ Produce Stakes 2019 odds on the progressive two-year-olds in the 1400m feature will be provided below once announced so stay tuned for the top Flemington Super Saturday racing markets. Jameka (2015) is one of the most famous VRC Sires’ Produce Stakes winners. Photo Credit: Adrienne Bicknell. The VRC Sires Produce Stakes field has a capacity of 16 starters and attracts a field of promising young staying types that could be heading towards a mile run during this campaign or next. Juveniles come from a variety of different lead-up races including the Listed Talindert Stakes (1100m) at the track the month before. Plenty of graduates out of the VRC Sires’ Produce Stakes field are eyeing a Sydney run during April’s ‘The Championships’ in the Group 1 ATC Sires Produce Stakes (1400m) at Royal Randwick. In 2017 the winner of the Melbourne race Sircconi ran a brave fourth in the Sydney Group 1, but Keepers (1983) was the last to do the double without another run in between. VRC Sires’ Produce Stakes nominations close the Monday before the race with the final field of acceptances and barrier draw released on the Wednesday. The official VRC Sires’ Produce Stakes 2019 field of two-year-olds will be published as of Wednesday March 6, 2019 ahead of Super Saturday’s Group 2 clash. The early VRC Sires’ Produce Stakes 2019 nominations close on the Monday leading-up to Super Saturday at Flemington with the full list of nominees to be published below. Taking two-year-olds with previous winning form or off a good Talindert Stakes run down the Flemington straight in February are good VRC Sires’ Produce Stakes tips. Single-figure fancies in betting have a gun recent record and so taking the favourite is another top VRC Sires’ Produce Stakes betting tip. Our Ladbrokes’ insider VRC Sires’ Produce Stakes 2019 betting tips on the two-year-olds to back and sack in the race will be detailed below heading up to the race so stay tuned. The VRC Sires’ Produce Stakes form guide details all of the essential race information including the trainers, jockeys, barriers and lead-up form of the horses in the race. The VRC Sires’ Produce Stakes form has stacked up in tougher races in recent years including Jameka (2015) who went on to win the Group 1 Crown Oaks (2500m) during the spring. The 2014 VRC Sires’ Produce Stakes winner Zululand finished runner-up to Go Indy Go in the Group 1 Champagne Stakes (1600m) at Randwick two runs later. In 2013 Shamus Award ran second in the VRC Sires’ Produce Stakes and won the Group 1 Cox Plate (2040m) that October. A link to our comprehensive VRC Sires’ Produce Stakes 2019 Form Guide will be provided for punters below the week of the race. Two-year-olds starting under $10 in betting have dominated the VRC Sires Produce Stakes results in recent years. Since Running Tall ($10 in 2011) the only other double-figure winner was Sircconi ($11 in 2017). Notable recent VRC Sires’ Produce Stakes winners include Jameka (2015), All Too Hard (2012) and Shamrocker (2010).